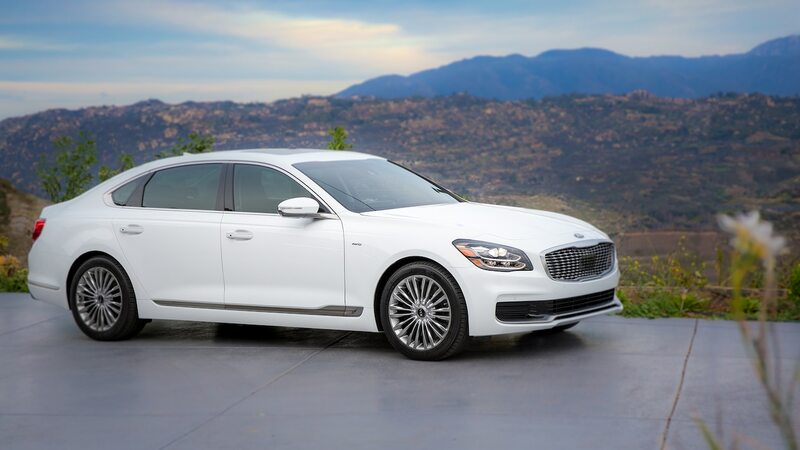 Back in 2014, Kia made its first foray into the luxury segment with the first-generation K900, a full-size rear-drive sedan aimed at the likes of the Lexus LS. Save for some featuring Morpheus from The Matrix and LeBron James, the original K900 had little public awareness, and Kia’s stigma as a cheap budget brand lingered during that car’s introduction. As a result, only a small number of vehicles found homes, making it a rarity on U.S. roads. The second-generation K900 returns to North America to challenge the status quo once again. This time, it comes with high-level craftsmanship and fine-tuned dynamics from former BMW M boss Albert Biermann, now head of high-performance development at Hyundai Motor Group. 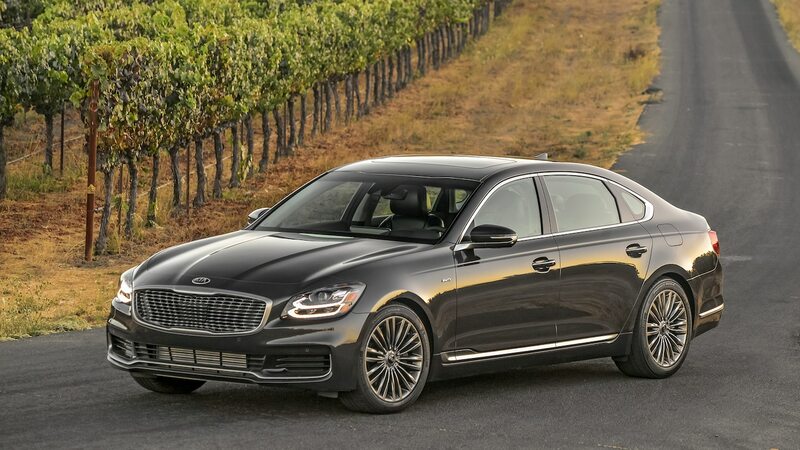 Design-wise, the 2019 Kia K900 eschews the swoopy coupelike silhouette in favor of a statelier, more conservative appearance. The car still stands out; styling cues such as the “duplex” headlights, a tiger-nose grille with a jewellike effect, and Bentley-esque taillights featuring LED patterns mimicking the front distinguish the 2019 K900 from the rest of Kia’s lineup. Inside, the cabin has a minimalistic layout that includes a tastefully uncluttered dash with just the right amount of buttons on the center stack. The unpolished wood trim gives the well-appointed interior a posh look without appearing geriatric or gaudy. Nearly everything inside feels solid, and cheaper plastics are positioned away from touch points. Even the faux wood on steering wheel is so convincing that someone had to tell us it’s an imitation. The 2019 K900 rides on a lengthened and widened version of the same platform underpinning the Stinger and Genesis G70. 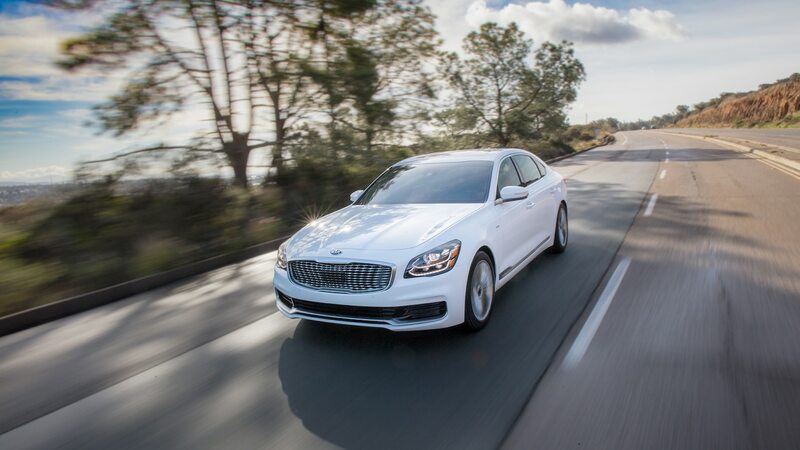 When combined with its new front suspension geometry and near 50/50 weight distribution, the result is a full-size sedan that’s learned new tricks from its sportier kin without forgetting it’s a luxury car. Turn-in is crisp, and body motions are superbly controlled, banishing the floatiness and wallowing that plagued the old K900. Steering is light and accurate but lacks feedback, further emphasizing comfort over sportiness. Handling on winding roads is fine for a 4,650-pound car, but the K900 drives its size and defaults to understeer when pushed too far. The standard torque-vectoring all-wheel-drive system helps bring the rear around and prevent the car from plowing through turns. Ride comfort is outstanding even with the stiffer North American chassis, gliding serenely over road imperfections. Put the electronically controlled suspension in Comfort+ mode and the car becomes a super-cushy isolation chamber, perfect for long road trips. Powered by a 365-hp 3.3-liter twin-turbo V-6, the 2019 K900 accelerates effortlessly to license-endangerment speed. With 376 lb-ft of torque available from low revs, passing, overtaking, and climbing grades are a breeze despite the K900 being as heavy as it is. The standard eight-speed automatic transmission is quick and smooth, silently working in the background; it even has a rev-matching function on downshifts, adding an extra layer of powertrain refinement. Other than in Eco mode, throttle response is immediate; the gearbox willingly drops a few gears to get you back to the meat of the powerband. In its home market of South Korea, consumers buy the K900 to get chauffeured. We had the opportunity to ride in the back seat and found that the 2019 K900 is an excellent limousine. With the VIP package, the rear seats recline, have extra headrest adjustments, and feature outstanding head- and legroom, making them ultra-relaxing. The right rear seat has endless legroom with the front passenger seat pushed all the way forward, making it the best in the house. Combine that with a supremely quiet cabin, and you can easily snooze while the driver whisks you to your destination. The front seats are equally comfortable, too, and offer plenty of adjustments to find that perfect position. Kia’s UVO multimedia system has virtually no learning curve; the massive 12.3-inch touchscreen is responsive, and the physical controls up front and on the folding rear center armrest are logical. The touchscreen is also positioned within easy reach for the driver and front passenger, making it easy to use on the fly. Adding the VIP package replaces traditional analog gauges with a 12.3-inch digital display featuring vivid customizable graphics, giving the K900’s interior a techier look and feel. Toggling through the digital gauge’s menus or the smaller display on base K900s uses the same button and scroller on the right side of the steering wheel, making it simple to use. Rounding out the infotainment experience is a fantastic 17-speaker Lexicon audio system that’s crisp and creates a fabulous listening experience on par with units found in more expensive vehicles. With sales expected to stay low, the 2019 K900 will remain an unorthodox choice. Pricing is expected to start at $60,000 for the base K900 and around $65,000 with the VIP package, making it a solid value when you consider its long list of standard equipment and its newfound capabilities. 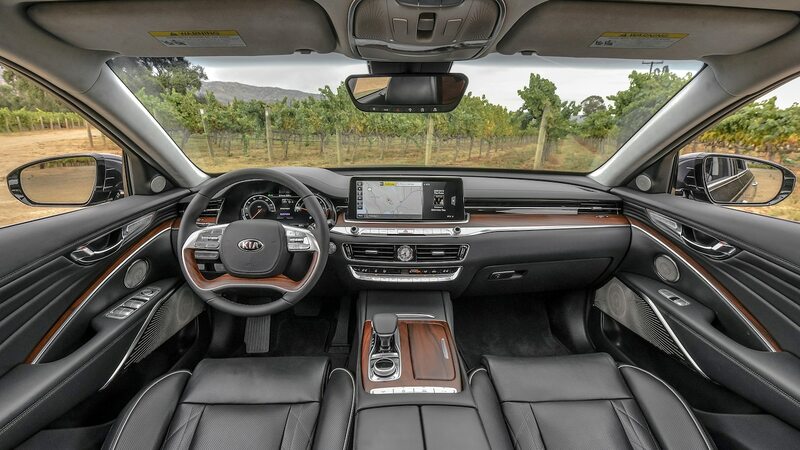 All the improvements Kia made to the 2019 K900 have created a truly upscale vehicle, proving you can have a premium car without the wallet-bleeding price tag. Buy the big Kia for the experience of owning something special that flies under the radar instead of showing off your wealth. The post 2019 Kia K900 First Drive: Low-Key Luxury appeared first on Motor Trend.